harassment of female referees by match officials / administrators in the football fraternity made its position public. President Wayne Forde at a press conference read a prepared statement on the issue. “First, I want to thank all parties involved for their patience in giving the Board of Inquiry time to properly conduct its investigation into certain allegations, and for affording the Executive Committee the space to consider the findings proffered and to make appropriate decisions. It is vital to respect due process in sensitive matters that may have legal, professional and personal ramifications for all those involved. This is the first time that an investigation of this kind and scale has taken place in Guyana’s football. There has been a significant amount of institutional learning during this difficult process. I can assure our football Fraternity and the general public that the Guyana Football Federation is now better equipped to handle issues of this nature. The Guyana Football Federation wishes to reiterate its unwavering support for all women and girls in the sport, and we remain committed to their empowerment and development. The Federation will not condone any form of sexual harassment, abuse, inappropriate behaviour or discrimination within the football fraternity, past or present. We know that this problem has plagued football for many years – but, we are taking a formidable stand against it. In recent times, the world has become much more aware of the pervasiveness of sexual harassment against women. The extent to which this has impacted on equal participation of women in everyday life may never be fully accounted for. Let me be very clear to our entire fraternity: Sexual harassment, abuse, inappropriate behaviour and discrimination of any kind have no place in football whatsoever. While football cannot fix society’s problems, under my leadership, the GFF will do everything it can to improve the football environment and protect the integrity of the women and girls in the sport. I would like to thank the members of the Board of Inquiry, led by Dr. Karen Pilgrim, for their professionalism, commitment and hard work in this sensitive matter. The Executive Committee has accepted the findings and recommendations of the Board of Inquiry. GFF Third Vice President, Thandi McAllister, will oversee the implementation of these recommendations. We will take steps necessary to support the healing of those affected, and to do what we can to urgently rebuild trust in our fraternity. In this regard, Head of Referees, Stanley Lancaster, has been dismissed from his position with immediate effect. Referees Assessor, Roy McArthur, has been provisionally suspended, pending the outcome of disciplinary proceedings by the GFF Disciplinary Committee, under the newly-approved Disciplinary Code. I encourage members of the media and our other stakeholders to continue to play their part by holding us to account for our progress in this area. Going forward, the GFF is committed to investigating all reports of abuse, harassment or discrimination. The five-member Commission which submitted its findings and recommendations was chaired by Dr. Karen Pilgrim – Vice President of the Guyana Olympic Association. Other members were Dr. Melissa Ifill – University of Guyana, Karen Joseph – Human Resources Consultant, Karen De Souza – Red Thread and Joy Nichola Marcus – Red Thread. 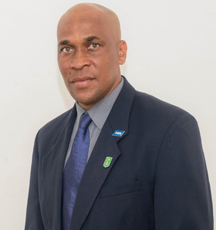 Meanwhile, the matter involving GFF Executive Member Keith O’Jeer and allegations made against him with regards to ‘inappropriate conduct’ has been forwarded to the federations Disciplinary Committee. ry which extended their unbeaten streak to 13 matches. Dowrich’s 65 lasted 86 balls and was decorated with 12 fours and he added 105 for the fifth wicket with Chase whose 68 came from 151 balls with nine boundaries but none of the remaining batsmen reached double figures as Pride were bowled out for 232. Veerasammy Permaul took 4-73 to move to 20 wickets from three matches, while Reifer took 3-53 and Romario Shepherd had 2-35. 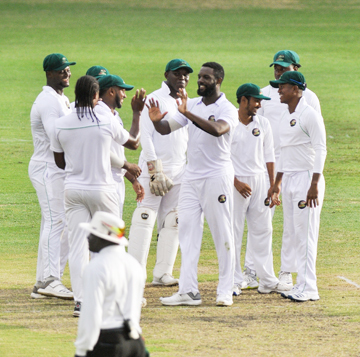 But their third consecutive win was much harder than they had anticipated and sparked memories of the last time they were beaten by Barbados in 2014 when set 68 to win at Providence, Jaguars were blown away for 66. Set 45 to win from 16 overs, Jaguars lost Tagenarine Chanderpaul (6) who was caught behind off Kemar Roach who bowled Chris Barnwell (6) before Miguel Cummins removed Chanderpaul Hemraj (9) and Sherfane Rutherford (0) as they slumped to 22-4. Skipper Leon Johnson (11) and the reliable Reifer (15) then saw them to 48-4 from 8.4 overs.Earlier, Pride, following-on, needing 188 to make Jaguars bat again, were bowled out for 232. Scores: GUYANA JAGUARS 548 (Chandrapaul Hemraj 144, Anthony Bramble 130 not out, Raymon Reifer 75, Sherfane Rutherford 54, Tagenarine Chanderpaul 37; Ashley Nurse 4-122) and 48 for four (Kemar Roach 2-18, Miguel Cummins 2-24). BARBADOS PRIDE 360 (Shane Dowrich 81, Jonathan Carter 68, Jason Holder 44, Kraigg Brathwaite 43, Shamarh Brooks 34; Veerasammy Permaul 4-124) and 232 (Roston Chase 68, Shane Dowrich 65, Shane Moseley 32, Shamarh Brooks 26; Veerasammy Permaul 4-73, Raymon Reifer 3-53). Tournament Defending champions The Guyana Police Force Football Club fought hard to keep out Paradise Invaders FC as they held on to win the second edition of the GT Beer/Candy Boss, Antics Promotion 8-a-side Football Tournament. The game, which was played at the All Saints Scott Church ground on Princess Elizabeth Road, New Amsterdam, Berbice, saw the lawmen prevailing 4-3 in a keenly contested affair. The game was evenly contested with both teams creating opportunities only to be thwarted in the end. Although it seemed that Paradise were having more possession in the first half, it was Police that were on the score sheet first when Deon Rodney scored in the 20th minute. It was soon 2-0 as Rodney scored again two minutes later. Paradise continued to take their chances and were rewarded in the 34th minute when Peter Wilson slotted home. Police showed no respite and scored again in the 38th minute off the boot of Mark Roach. Paradise pulled one back two minutes later off the boot of Jamal Cambridge as the fans were kept on their feet. The see saw battle continued and Paradise were finding their range and giving the Cops endless trouble as they pressed for the equaliser which came in the 51st minute as Francis Denvon placed one in the back of the net to lock the scores at 3-0. As both teams fought hard for the winning goals it was the busy Roach that was able to seal the issue with his second goal in the 60th minute for the 4-3 win. Monedderlust FC opted not to contest the third place play off against Golden Star who took on Rosignol instead and won 2-0. Police for the win earned $600,000 and the Banks DIH Trophy, while Paradise will collect $300,000. Golden Star will collect $200,000. The organizers thanked their supporters, Banks DIH Limited under the GT Beer Brand; Fly Jamaica, Regional Health Services, Foot-Soul, Bobb and Sons, National Sports Commission and Integrated Security among others for their assistance. Tito “Candy Boss” Sancho was the coordinator. Guyanese Lionel D’ Andrade (right) with winner Ronaldinho Pinas and Jonathan Baktawar on the podium. 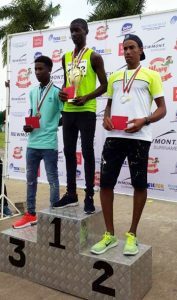 Guyanese athlete Lionel D’ Andrade continues to add to his collection of prizes when he placed second in Bigi Broki Waka 10k in Paramaribo, Suriname. The race, which attracted some 180 starters, saw D’ Andrade, 38, finishing in 37 minutes 23 seconds behind Ronaldinho Pinas of the host nation in 36.15; Jonathan Baktawar of Suriname placed third in 37.50. D’Andrade, who won the event in 2018 and is based in Trinidad and Tobago, told Kaieteur Sport that he wasn’t fully prepared for the event since he was in Guyana on vacation. “I was training on the roads here and this didn’t allow me to train for speed as this type of training is not usually done on the roads and I found the hill a bit difficult,” he added. D’Andrade won the Cross Country 8k which was held in Berbice on December 30 after a four-year absence of competing here. He took part in 44 races in 2018 and won 19. D’Andrade expressed gratitude to his sponsors Builders Lumber Yard of Lombard Street. The six member beach volley team that will be aiming to qualify for the 2020 Olympics in Argentina this March. 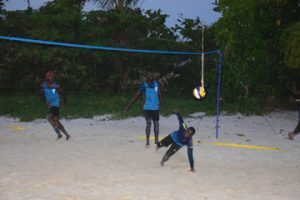 which was overseen by the President of the GVF, Levi Nedd, saw 13 rounds of competition where three teams earned the right to represent Guyana at the Beach Volleyball Olympic Qualifiers this March in Argentina. According to Nedd, funding for this costly trip will be provided by the Guyana Olympic Association (GOA). Each team consisted of two players. The team of Juan Velazquez and Vance Harding will be making their first appearance in the tournament, while the other male team in Quacy Marthson and Ian Bagot earned their spot after a player from their semifinal clash got injured; forcing the opposing team to forfeit the match. 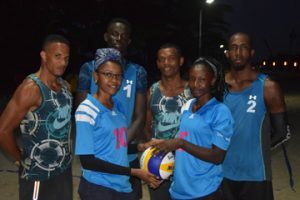 Candace Mentore and Philana Sampson of Port Mourant Volleyball Club qualified as the lone female team representing Guyana despite not taking to the sand for the day with the other female team providing a walkover. The event saw many players volunteering to make it a success, providing umpiring and scoring duties even between matches. The second semifinal was played at almost nightfall at the Marriott beach front yesterday. Racing fans and turfites are in for a treat this year after the Jumbo Jet Thoroughbred Committee has disclosed their racing dates for 2019 and also has indicated that the Triple Crown horseracing championship, which was hampered by the weather last year, is set to be the major attraction this year. Coordinator Junior ‘Jumbo Jet’ Mohammed disclosed that unfortunately only one leg of the scheduled three of the Triple Crown was held last year and would have been a disappointment for fans and the organising committee. However, they are hopeful of better conditions this year so one of the top racehorses locally will get the chance to be crowned Triple Crown champion. He informed that the Triple Crown will be contested between the months of February and April of this year. The dates set for the Triple are February 24th, March 24th and April 21st. Another key date is August 18th when the Guyana Cup event is staged at the Rising Sun Turf Club, West Coast, Berbice. The other meet date set by the committee is November 2nd.